The thing about stores like Lowe’s and Home Depot is that the customers have all the power. You’re combining retail with home improvement in startlingly awesome ways. Forgoing the contractor, just hiring someone to do all the work, and instead opting to maybe get a tip or two, the materials you need, and then doing the work on your own. This is exactly why stores like Lowe’s and Home Depot would make a killing with their customers if they would offer free gifts like a promotional multi-tool, or utility knife! Driving up visibility, interest and sales — nothing beats free gifts, and it’ll bring more customers into the store. Plus this fits the demographic perfectly. A multi-tool is the ultimate tool for the every man. You can be a lawyer, or an accountant, or someone who works on cars for a living, it doesn’t matter — with a promotional multi-tool in hand, that customer will always have a lasting impression of the business at his fingertips (literally). Shopping at Lowe’s or Home Depot is all about tools. Doing it yourself with a little bit of help from the experts. It takes the best qualities of the all-purpose contractor/builder and the great advantages of a central retail hub. The multi-tool does exactly the same thing. You get all your tools, it’s easy to use, you don’t have to be an ‘expert’ to use it. So check it all out while you can. Contact us when you’ve found a design that fits your style. BRAVA Marketing has the ability to up your promotional advertising, especially if you’re local. You want to communicate well to your customers? 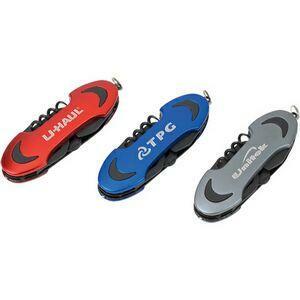 A custom promotional multi-tool gift or upsell will change your game in big ways! Being a carpenter or contractor can be tough for obvious reasons. One, you’re basically in business for yourself. And there’s a lot of competition out there. You’re at the whim of the demand of someone who needs repairs on any given day, but you need that immediate connection. Someone calls, you answer. Someone emails, you answer. And that demand will be preeeeeetty random — like a branded multi-tool, now that we mention it! 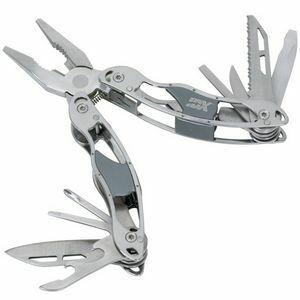 A branded multi-tool. Think about it. This largely may be the only tool a customer will actually see at any point in time. Other tools, obviously, are harder for a customer to see. Like you using a hammer, or a drill. But a multi-tool, utility knife? One flash, perhaps even consulting a customer even, and the imprint of your brand is instant. The multi-tool is the tool you’ll use everywhere. Not just on the job. Even customers identify with those little contraptions! Ask multiple homeowners if they may even know what a “snake” is. Many might not. But a utility knife? That’s an American institution. And you’re successfully in business. You can even go the extra mile and supercharge your promotional advertising by buying them in bulk and offering them as gifts to clients after projects have been completed. Remember…. Competition: it’s cutthroat. So visit BRAVA Marketing right now. Peruse the many design possibilities. And contact us today. Your next renovation project is waiting.